The sport of athletics encourages athletes of all abilities and ages to compete at their optimum level. Through the track-and-field-based athletics training program, participants can develop total fitness to compete in any sport. As with all Special Olympics sports, athletics offers athletes the opportunity to learn through skill development and competitive settings and to be involved in large social settings. 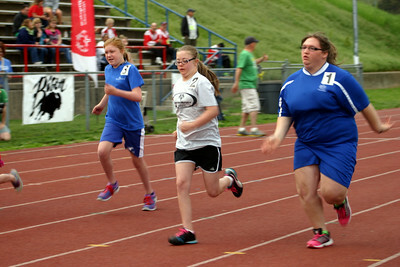 Summer Games Athletics is being held over three days in Omaha at two venues. Level A Athletics takes place at Kiewit Fitness Center on the Creighton Campus on Thursday, May 21 from 10am-3pm. Field Events including the Pentathlon and the 200, 400, and 800 meter walks will be held on Friday, May 22 at Omaha Northwest High School from 6pm-9:30pm. Running and the shorter walking events will be held on Saturday, May 23 at Omaha Northwest High School from 8am-3pm.